​In today's world, children and teens are bombarded with conflicting, ever-shifting standards of ethics and morality. At the same time, you are trying to teach and instill good values at home. Fortunately, a really great book has the power to counterbalance these outside influences and teach children important lessons as they grow. It might be a book on kindness after your child experienced or witnessed cruelty. It might be a book on expressing emotions after your child s​aw or heard scary news coverage, or maybe a book on understanding differences after your child saw someone who looked differently than they do. The American Academy of Pediatrics (AAP) and Reach Out and Read have compiled the following list of books—organized by age and topic—to help you raise children who are aware of the world around them, curious, brave, kind, and thoughtful. Parents and caregivers are encouraged to review these titles in advance of sharing them with their children. Then read together! 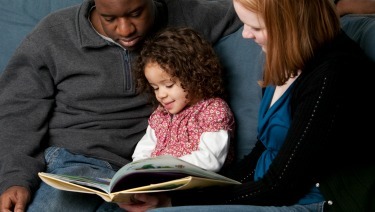 Books are great conversation starters that can give you an opportunity to talk to your children about these issues and help them learn and understand your family's values. Teaching kindness to children is an important skill to build and reinforce at all ages. Young children can learn how small acts of kindness help and please others, but teens can learn broader, larger concepts grounded in morals and ethics. Children may see anger, sadness, and loss in parents and other adults in their lives and be uncertain how to respond. Younger children may have difficulty naming their emotions, but find it easier to identify with a character in a book. Older children may have difficulty sorting through complex feelings and worry about burdening adults who are struggling themselves. Books can help children process, clarify, and put a name to their feelings. Bullying and harassment are difficult topics for everyone, and they are an increasing issue in schools across the country. It's common for younger children to repeat language they've heard without understanding the implications of what they're saying. Those who are harassed (or are worried about being harassed) may have strong fear and anxiety. Children who are bystanders may not know how to respond, particularly if they fear being bullied themselves. Learning how to listen well and respect different views are important life skills. While younger children find it difficult to take the perspective of others, they gain that ability over time. Older children may become great debaters—especially with their parents. Books can offer models for engaging with others who have different views in a respectful and productive manner. Children are naturally curious about others (particularly other children) who fall into groups other than their own. Think of your child's curiosity as an opportunity to teach him or her about respecting these differences. Remember, in order to raise kids to embrace diversity, you'll need to give them access to a variety of different cultures and traditions—books are a great way to do that! Many children are drawn to helping others—even at young ages. Maybe it is raising money for a cause or having a passion for issue impacting their community. Books can help them understand the broader concepts of social justice and civic engagement. Younger children tend to thinking of things as "good vs. bad," but as they get older they develop very sophisticated and nuanced moral reasoning. Dipesh Navsaria, MPH, MSLIS, MD, FAAP is an associate professor of pediatrics at the University of Wisconsin School of Medicine and Public Health and is director of the MD–MPH program there. He has practiced primary care pediatrics in a variety of settings and is the founding medical director of Reach Out and Read Wisconsin. Dr. Navsaria regularly writes op-eds on health-related topics, does radio and television interviews, and frequently speaks locally, regionally and nationally on early brain and child development, early literacy, and advocacy to a broad variety of audiences. Follow him on Twitter @navsaria, Facebook, and visit his website www.navsaria.com. Editor's Note: Our collective thanks to the following colleagues who also helped compose this list: Amy Shriver, MD, FAAP, Jenny Radesky, MD, FAAP, Perri Klass, MD, FAAP, Dina Joy Lieser, MD, FAAP, and the librarians at the Cooperative Children's Book Center, School of Education, University of Wisconsin–Madison.